The transport in London has to be one of the best and Inclusive in the world. It is not cheap however, so do make sure your budget includes travel costs. For me the best way of getting around London is on foot as this allows you to really experience all that the city has to offer. However London is huge and if you are on a tight time budget you will need to get from one place to another as quickly as possible. There are many ways to do this including bus, bike, boat, taxi and the underground train service known as the tube. 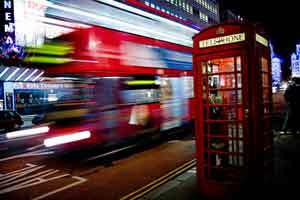 These London travel tips will help you to discover all the transport in London on offer and the best way to use the services. The London public transport system consists of underground and over ground trains, buses and a river boat service. None of these are particularly cheap and every journey no matter how short is subject to a minimum fee. Oyster cards - This is a sort of debit card for public transport. You have to put a certain amount of money on your card which is then used up as you journey around the city. You have to touch your card both in and out for every journey on electronic pads at the stations and make sure you have enough credit on the card before you travel. There is a £5 returnable fee to obtain a card. Travel Cards - The easiest and cheapest way to use the transport in London is to buy a travel card. This allows you to take as many journeys as you like using any of the public transport services in one day. Available at stations and some shops displaying the symbol. 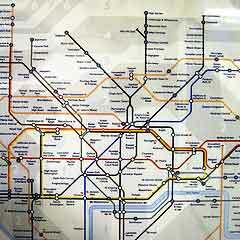 London's Tube network is very extensive and covers the whole of the city and reach far out into London's suburbs too. Some parts of the underground system are the oldest in the world dating back to 1863 and although the system is constantly being modernized the London Underground system does have a reputation of breaking down fairly often. As a Londoner we are used to this, as a visiter you may not, so be warned. A single fare on the tube at the time of writing costs £4 for adults, costs can soon mount up if you are travelling around London from station to station. Use a Oyster card or better still a Travel Card to reduce this cost. An iconic sight in London are the famous red buses recognized the world over. These are great for getting around London and still being able to see the sights. However they can be very crowded and it can take some time to get around due to heavy traffic. They are still one of my favorite ways of getting around London though. Their are two heritage routes which are still running the famous Routemaster buses which were phased out of general use in 2005, these are routes 9 and 15. A single adult fare costs at the time of writing (2012) £2.20 regardless of how many stops you are travelling. Use a travel card or Oyster card instead to save money. Use this transport in London Journey planner to help you find the bus or tube you need. As you travel around London you will notice many blue bicycle docking stations dotted around the city. These are public use bikes and can be used 24 hours a day and there's no need to book. Simply pay for the bike and return it to any docking station when finished. Simply either register online at https://web.barclayscyclehire.tfl.gov.uk/member or pay at the docking station with your credit or debit card. The cost of using a bike is composed of a hiring charge and the amount of time you've got it for. 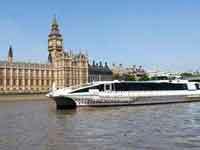 Although there are many boat companies operating on the Thames, only the Thames clippers operate commuter services. They run 6am - 10pm between London eye Millennium Pier to Woolwich Arsenal Pier with several drop off points alone the way. Fares cost between £3.50 - £5.50 for adult and £1.70 - £2.80 for kids. Travel card holders get a third off of this price. 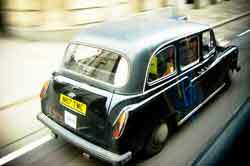 Using a taxi is not a cheap way to travel around London but it is the most comfortable. To be sure of a safe journey I would always recommend that you use a registered London Black cab rather than a minicab service. Black cab drivers have to be licensed with the Police and under go a very rigourous training known as "the Knowledge" meaning that they know the best and quickest routes around London. To hail a cab simply hold up your arm to any black cab with its yellow "For Hire"sign lit. The journey is metered and you will be able to see how much your journey is costing you as you travel. Tipping the driver is the norm, as rule most people simply round up to the nearest pound rather than giving a percentage of the cost of the trip. Simple and quick answer is don't, it's a nightmare. Traffic, little and expensive parking and the London congestion charge all make driving your car through central London a terrible and costly experience. Save yourself a lot of hassle and money, use public transport or walk when you can. You'll see so much more of London and have a great time too. Discover the Dickens House Museum in London. An unrivalled collection of Dickens manuscripts, personal items and paintings In his original home. 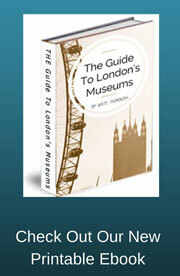 I promise to use it only to send you London Museums News. By Kate Tilmouth Copyright © 2017 www.love-london-museums.com. All rights reserved.